Rutherford B. Hayes Middle School will never be the same. Danika is in deep trouble for hitting Mrs. Hefty's right temple with her brown bag lunch. Toni is trying out for the boy's football league...against her dad's wishes and the school rules. Kaitlyn is completely boy-crazy and will stop at nothing to express her love for her older brother's best friend. Yuzi is the new kid at school whose name nobody can pronounce, and in a valiant effort to fit in she is traumatized by being invited to dress up like a stalk of corn at the town's annual Popcorn Festival. Their worlds collide one afternoon when they all end up in after-school detention and the Secret Keeper Girl Club is formed to save the day. Full of comedy, action, emotion, and life-transforming lessons, each book includes a mother/daughter Girl Gab assignment in an appendix. 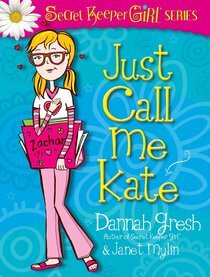 About "Just Call Me Kate (Secret Keeper Girl Series)"